Premise: Two teams of two contestants compete against each other in a series of two rounds. In round one, teams are shown five categories each containing three subjects. Once a category has been selected, both teams will be shown a maximum of five “keywords”, displaying one at a time, that leads to a mystery subject. Each subject’s point value starts at 50 points and decreases 10 points for each additional keyword shown. If a team buzzes in with the correct answer, the team is awarded the remaining point value for the subject. If an incorrect answer is given, the other team will have a chance to guess the the subject unopposed with one extra keyword given. In round two, the gameplay is the same except the point values are doubled. During the second round, one category features a “Play or Pass” question worth up to 200 points, which enables the team who selected the category to play the next subject with fewer keywords given or pass it to their opponents. 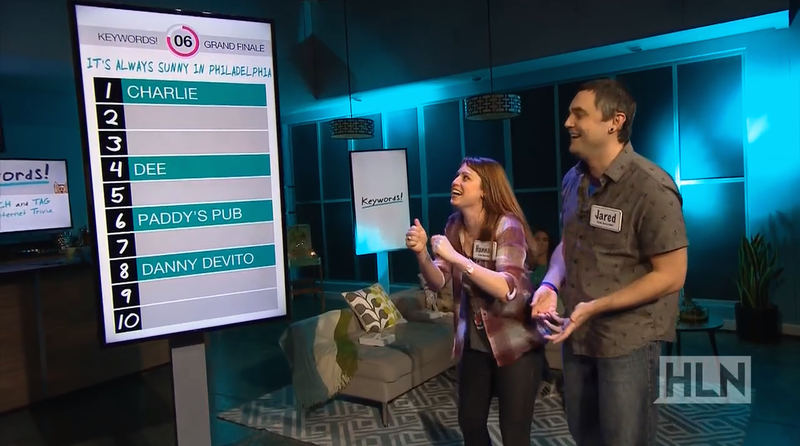 The team with the highest score at the end of the second round wins a prize and advances to the Grand Finale bonus round. The losing team receives a consolation prize. In the Grand Finale, the winning team chooses a category and will be given 30 seconds to try to guess five out of the top 10 keyword search terms pertaining to the subject. If the team can successfully guess five of those keywords, they will win a grand prize vacation package. 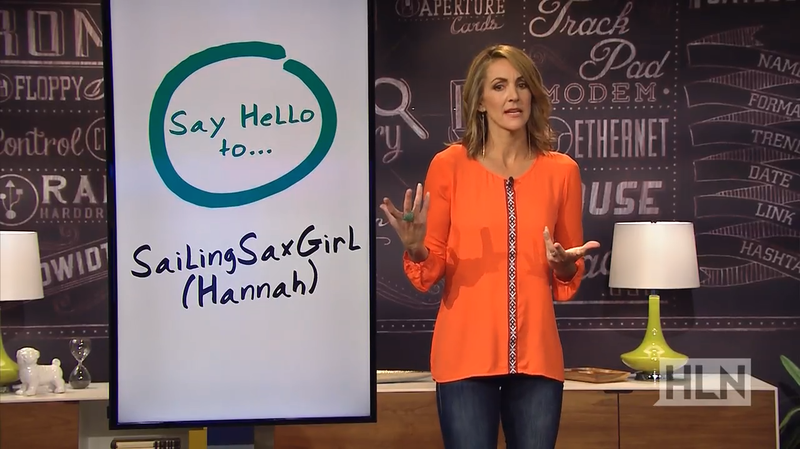 As a part of HLN’s plan to rebrand their network and gain more viewers, the cable news network decided to add more programs geared toward the younger, social media-savvy generation including Keywords, which is based on the mobile game of the same name. Being the second game show to debut on a news network this year, Keywords is not a bad way to kill 30 minutes of your time. The game show centralized around today’s trending, Google-searching society is a little tougher than it seems. Not only does the show feature pop culture and entertainment trivia, it also briefly delves into the world of science, literature and geography. A few reasons why Keywords is an interesting show worth stopping on if you’re channel surfing include the team vs. team dynamic that makes the game more lively, a good host like Summer Sanders, the decent prize budget that includes trips to Mexico and iPads, the simple, play-along friendly, engaging gameplay which similarly resembles the puzzles seen on TalkAbout and Password Plus/Super Password, and the casual coffeehouse lounge set design that creates a relaxed and cozy atmosphere. I also like how the show gives a unique spin to the contestant interviews with the “Search You” segment at the end of the first round by introducing each contestant by their social media handle followed by a “Throwback Thursday”-type picture of them. The only minor problems I have with Keywords are the editing and the redundant main game format. Subpar Editing: As I was watching the second episode, I noticed after a team correctly guessed “John Lennon”, the director cut to the team and back to Sanders standing beside the game board and instead of showing Lennon as the correct response, the monitor briefly displayed “Charles Dickens” before moving on to the next puzzle. It is entirely possible that the Dickens keyword puzzle was thrown out during the taping due to a technical error. It’s not too uncommon hear something like this happening on game shows. In fact, most shows would add a disclaimer during the end credits stating that a question was tossed out due to said error. If this were the case, then the “Dickens” answer should have been edited out completely for the sake of good continuity, despite whether the answer was shown for one second or one frame. Simple, But Too Simple: Rather than replicating the first round, the second round could have been formatted like a turnabout, Pyramid-style catch-up (similar to what Child’s Play did later in the series with their Turnabout bonus round) round where teammates have to convey search clues to their partners to get them to guess the subjects. The clue giver could also start each clue with “I’m searching for…” to fit the show’s theme, but I digress. A round like this would be helpful to add a little more variety within the show. Overall, Keywords is good for what it is as a cable news game show. 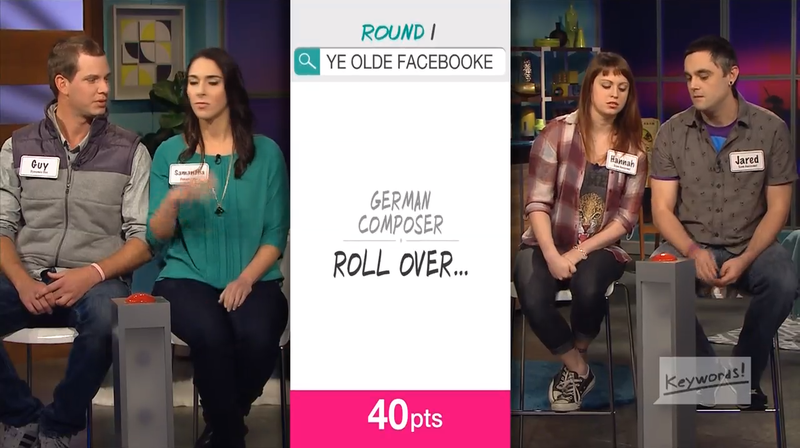 It’s viewer-friendly, simplistic format makes the show fun to watch and will even make you want to download the mobile version of the game (which is available for iOS and Android devices) to test your Internet trivia. With this being said, I don’t believe this show will garner enough interest to last for more than a season, especially after reading about series’ doubleheader premiere attracting a paltry 81,000 viewers in its 10:00pm Tuesday time slot. Watch new episodes of Keywords every Tuesday night at 10:00pm ET on HLN! One of the worst shows on tv today. BORING.